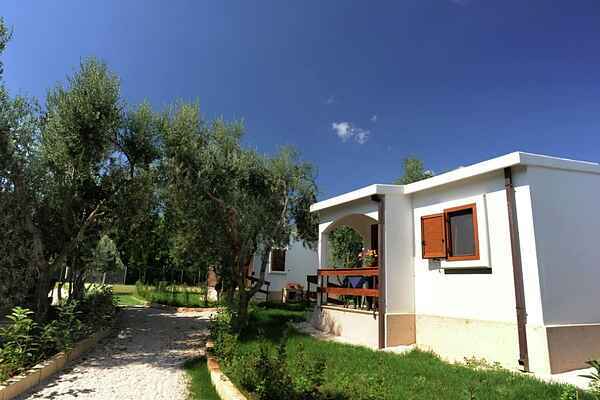 The structure is new, in Mediterranean-style, two steps from the sea, in the heart of Gargano National Park. Immersed in green in the background of olive trees to live in the maximum relax and privacy, in direct contact with nature. The location offers unique landscapes and views in the nature of the Gargano promontory. Besides the beautiful beach, you can take relaxing walks and hikes in the park, by bike or by foot, organizing excursions and lunch bags or tastings typical products in Masserie. The location has great culinary tradition with famous kitchen for its flavors. Possibility to buy local products. On the inside of the structure there is a bar, swimming pool with solarium and sun beds, tennis court and soccer on synthetic grass, small children's playground, parking, corner with local products, and every other comfort for a relaxing holiday. Suitable place for the family and the couples, ideal for any age. From 30 May to 1 September there is also a beach service with reserved private beach equipped with umbrellas and sun beds, with a bar and restaurant directly on beach. Bikes are always available for rides.